We have four copies of HBO's Game of Thrones Complete Season Three. There are two Blu Ray/DVD copies and two DVD copies. Some special features include deleted/extended scenes, introductions to new characters, backgrounds on Westeros/Essos groups, cast/crew reactions to The Red Wedding and interviews with and commentaries by actors, producers, directors and Martin. We'd prefer to give these discs away to regular contributors to thank them for reading our blog. You must have commented on this blog at least twice during the past 120 days. These items will be given away to the first four people (non blog moderators) to send the correct answers to the below questions, along with their blog id, mailing address/name*, and their preferred version (DVD or Blu-Ray) to our email address. 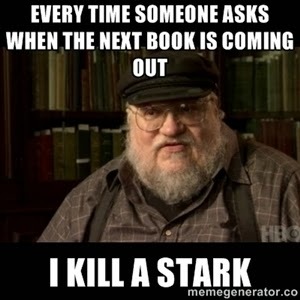 Please use subject line "GAME OF THRONES GIVEAWAY". Answers must be received today before 5 PM EST. Answers should be as specific as possible. Proper names are preferred. A correct answer is "X is so-and-so's brother", not "His brother is that guy with the big nose who dresses in black". Ties will be resolved by blog management. If no one is interested or can answer the questions correctly then perhaps we'll just keep these items for ourselves. Otherwise winners will receive their copy within seven to ten business days. Comments are/will be disabled for this post so please don't place your answers here, the contact page or anywhere else on the blog. Doing so may lead to executions bannings. I'm sure as an upright honest person you'd be fine with the Stark honor system. But it might be a tragic mistake to remain honorable and spend precious time searching your fading memory while your more pragmatic Littlefinger type competitors search Google (or posts on this blog) and thus win "your" prize. Well winning isn't everything. It's the only thing. You saw what happened to Ned when he tried to be righteous. Good luck, whichever road you choose. Snicker. *If you really prefer not to use your government name because the Mob is looking for you that's perfectly ok as long as you can provide us a valid mailing address. PO Boxes are fine. Including Jon Snow, match each Stark child (living or deceased) to his or her direwolf (living or deceased). Which character is derisively called "halfman" by his allies and routinely threatened with having his manhood chopped off and fed to the goats? Which house uses the song "The Rains of Castamere" as a warning to its enemies? Who was Renly Barratheon's lover (not his betrothed)? Who constantly says "You know nothing, Jon Snow!" Who is the Hound's big brother? Nickname or partial name is acceptable. Which house has the words "We do not sow". Bonus Question: If you get this correct you can get some other questions wrong and still win (if you are among the first four respondents). What is Littlefinger's sigil?